Utah is hosting this year's RMATA Annual Meeting and Symposium, April 11-15, at the Salt Lake Sheraton. We need your help to make this year the best year yet! Volunteers are needed from Wednesday evening through Sunday afternoon. If interested, please click on the link to volunteer. The UATA recognizes its annual award winners during the UATA Business Meeting on December 2, 2017 at Southern Utah University, Cedar City. These individuals have shown commitment to the Utah Athletic Trainers' Association and their profession. This year, UATA inducted Mike Tolman, ATC as AT of the Year for Secondary Schools, Rhett Farrer, ATC as AT of the Year for Administration, and Ricky Mendini, ATC as AT of the Year for College setting. UATA is proud to announce, Ben Davidson, our newest member to our UATA Hall of Fame. Prior to retirement, Davidson served the SUU Athletics community. He volunteered his time on many occasions, working with the Utah Summer Games and olympians, serving on the RMATA Board, UATA Board, NATA committees, and the BOC Examination Committee. The UATA would like to congratulate our 2017 award winners! Ben Davidson is inducted into the UATA Hall of Fame. Picture with him is (left to right) Corinne Nyman, Lisa Walker, Valerie Herzog. On December 2, 2017, the Utah Athletic Trainers' Association held their annual meeting at Southern Utah University in Cedar City. Kregg Lunt, MSPT began the morning speaking on shoulder rehabilitation while Alyssa Gomez finished out the conference speaking on sports nutrition for the collegiate athlete. Overall, the day focused on prevention, surgical techniques, and rehabilitation of the ACL. Ron Chamberlain, PhD, CC-AASP discussed with the attendees the psychological considerations when working with ACL patients. Other speakers included Cody Bremner, PhD, LAT, ATC (Recommendations to Increase NMES Training Intensity), Robert Nakken, MD (Prevention and Surgical Techniques of ACLs), and Jona Droubay, DPT, ATC (Post-operative ACL Rehabilitation Protocol and Progressions. 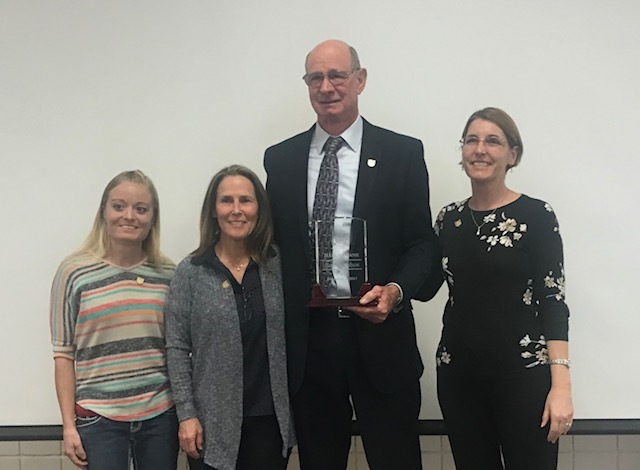 The Board of Certification for athletic trainers awarded Rep. Paul Ray from the state of Utah the Public Advocacy Award. The ward was presented on July 14, 2017 in Omaha, Nebraska. Paul has been and continues to be an advocate for the public and athletic training. He has served as the voice of athletic training in the Utah legislature since about 2005. He has helped draft and support legislation that has brought athletic trainers into a position of recognition in Utah. Sponsored bills have included: athletic training licensure, listing athletic trainers as health care providers in key sections of the Utah code, protection of youth athletes mandating an athletic trainer in every high school, concussion legislation, and third party billing for athletic trainers. The RMATA just purchased 120 tickets for the Wednesday night (June 28th) game. The Astro’s will be playing the A’s, and I believe, if their website is correct, that it’s $1 hot dog night at the ballpark. Tickets can provided for MEMBERS of the association…but not for friends, associates, or colleagues from other places. If you will be in Houston at the NATA Conference and would like to attend, please let Lisa Walker know, (lisa.walker@nebo.edu), so your ticket can be reserved. Tickets are available on a first come/first serve basis. The Safe Sports School Award recognizes secondary schools around the country that take the crucial steps to keep their athletes free from injuries. Take this quick 9-question quiz (pdf) to see if your school is an ideal applicant for the award. The UATA is offering to reimburse award winners. To apply for the award go to nata.org and apply. Registration is now open for the 2016 UATA Annual Meeting. You may register here. Please note that lunch is provided, so please register by November 29th if possible. Registration at the door will be allowed for a $10 fee. See you there! Members, so many times we fail to recognize our own for the contributions they make. Don't miss the opportunity to nominate someone deserving for this year's Athletic Trainer of the Year Award. It's easy! Just take a look at the criteria below and submit your nomination to Nancy Weir by November 19. Made contributions to the Athletic Training profession that has brought distinction to the UATA. Nominations will close November 19, 2016.